The Best Beef Tenderloin Steak recipe made in the oven. 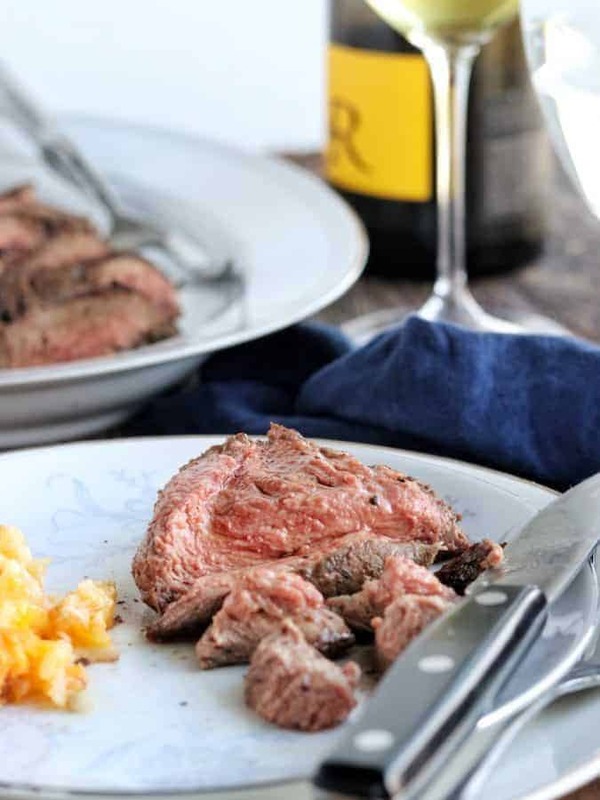 Tender beef tenderloin is seared then roasted to perfection for this special holiday meal idea. 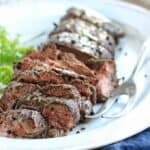 Beef tenderloin served on Christmas has been a tradition in my husbands family before I was ever a part of the family. My mother-in-law made beef tenderloin in the oven Christmas night. Everyone looked forward to this delicious steak dinner. Even though my mother-in-law is no longer with us, we continue this tradition each year, taking turns hosting this special get together. It’s in my nature to research the heck out of a special meal, making sure every detail is covered. I may or may not obsess a bit about the details. While annoying to some, I find it works well to have all this information before moving forward. 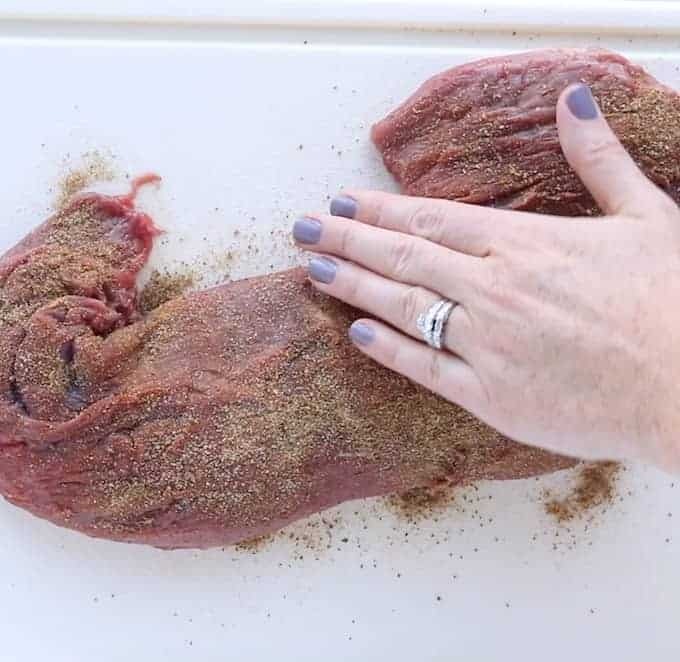 Because of all this info I’ve gathered on the topic of how to make perfect whole roast beef tenderloin recipe in the oven, I’m excited to share it with you today. 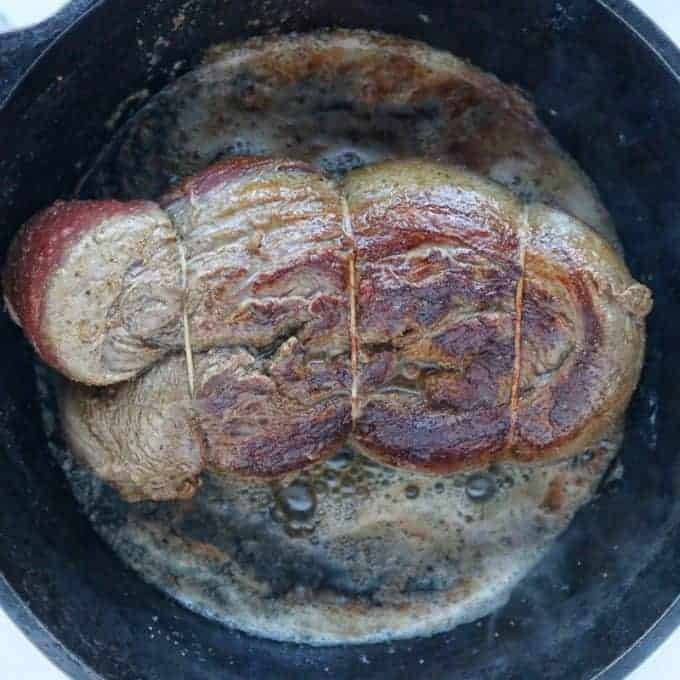 I fully believe this is the best way to cook beef tenderloin. For those of you who like to watch to learn how to make steak, check out the video. If you prefer to read the step by step instructions keep reading! 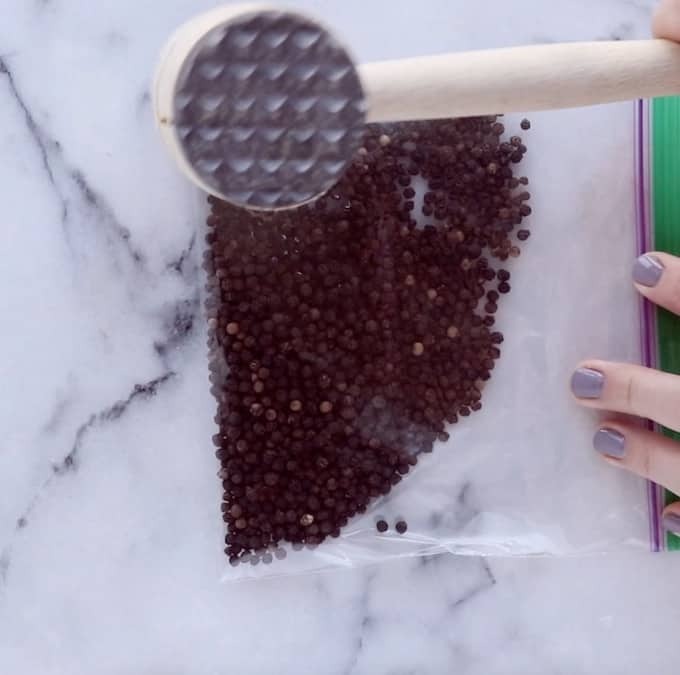 Place whole peppercorns into a ziplock bag, then crush with a kitchen mallet or rolling pin. Set aside. 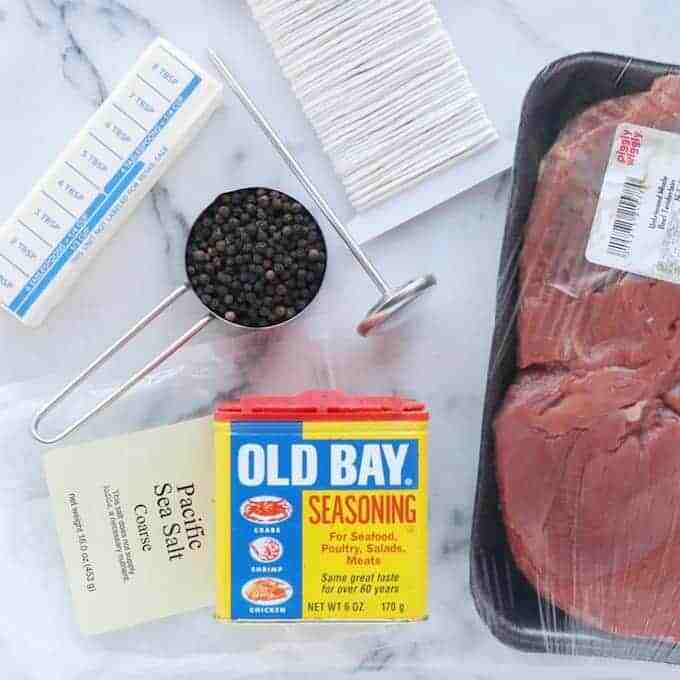 Place trimmed beef tenderloin onto a cutting board or clean large surface and season liberally with the seasoning salt and the salt. Watch the video to get a better idea. Turn the ends of the tenderloin into itself so the thinner ends are now in the middle of the tenderloin. 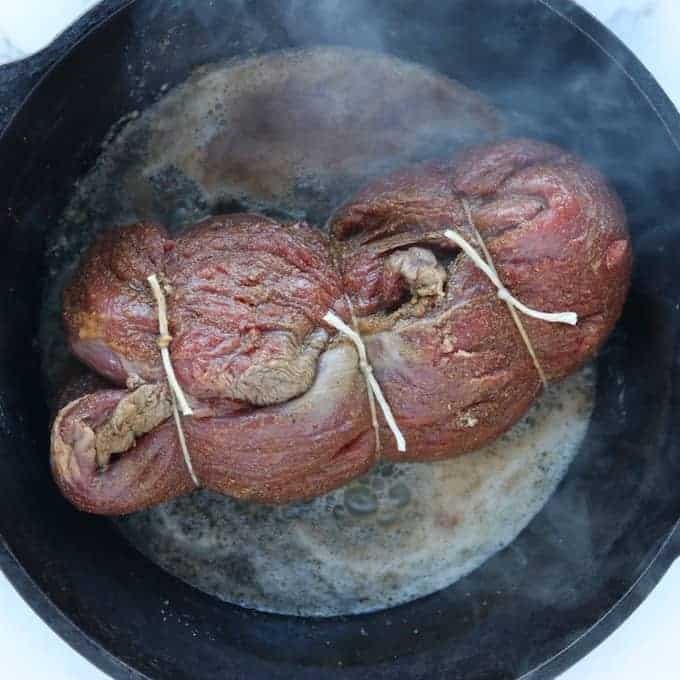 Place 3-4 pieces of cooking twine under the tenderloin and tie into knots, trimming the ends, so that the ends stay put and the meat is not wrapped into a nice rectangular shape that will fit into a skillet. Heat butter and olive oil over medium-high heat in an oven-safe skillet. Using tongs, place the tenderloin into the pan. Sear for 3 minutes, then turn. Repeat until all 4 sides are seared. Place seared tenderloin onto your oven’s roaster pan. Spread the crushed peppercorns onto the steak, place butter cut into chunks over the steak, and place an oven-safe meat thermometer into the steak. Cook for 15-20 minutes or until the thermometer reaches 140 degrees. Make sure to slice against the grain for tender slices of steak. To get started, gather your ingredients, you don’t need many for this easy steak recipe. Beef tenderloin is the most expensive cut of meat on the steer. A trimmed center-cut tenderloin can run you as much as $25 to $30 per pound, but there are ways to minimize that cost. One way is to buy the tenderloin whole and untrimmed, bring it home, and trim it yourself. 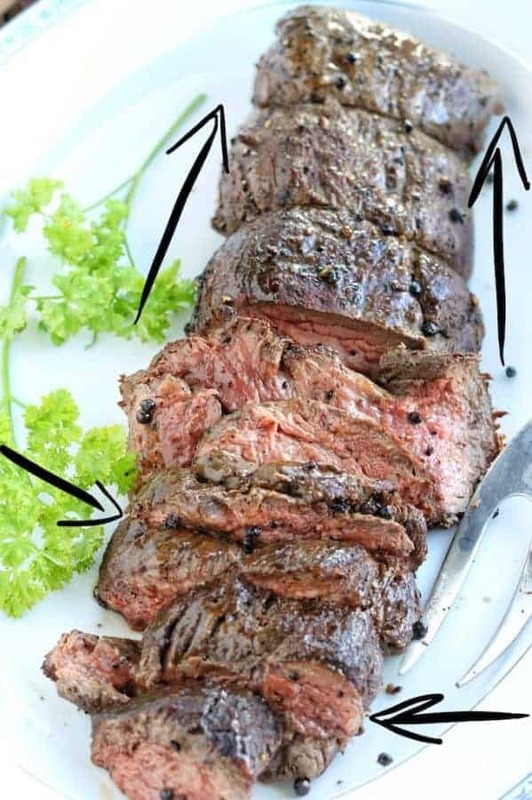 For instructions on how to trim a beef tenderloin at home head here. Not up to this task? Me either. I have the butcher at the store do it for me. I often find that the butcher is happy to do this free of charge. Pro Tip: Watch for sales on Beef Tenderloin around the holidays. This cut of beef is very expensive, but it’s often on sale this time of year. My favorite part of this recipe is the flavor from the crushed peppercorns, if you’re not sure about this ingredient, trust me, it’s amazing. Once you’re ready to make the beef tenderloin steak, start by getting an oven-safe skillet heated over medium-high heat on the stove top. Next, get out a large cutting board or sheet pan and place the steak on it. Pro Tip: Generously season both sides of the steak with your chosen spice blend. Remember that the steak will be sliced thinly – you want the seasoning to coat all parts of the steak, so go heavy on your seasoning. Once seasoned, wrap the ends inward to that they are tucked into the middle. This helps to cook the steak in the oven evenly. It also makes searing the steak a lot easier. You may notice that the steak looks like part is already browned from searing. You are correct. I tried to place the steak into the pan to sear and quickly realized once it didn’t fit, that I had missed a very important step- wrapping the steak! Don’t forget this step – but if you do, you’ll figure it out when the whole beef tenderloin does not fit into your skillet! 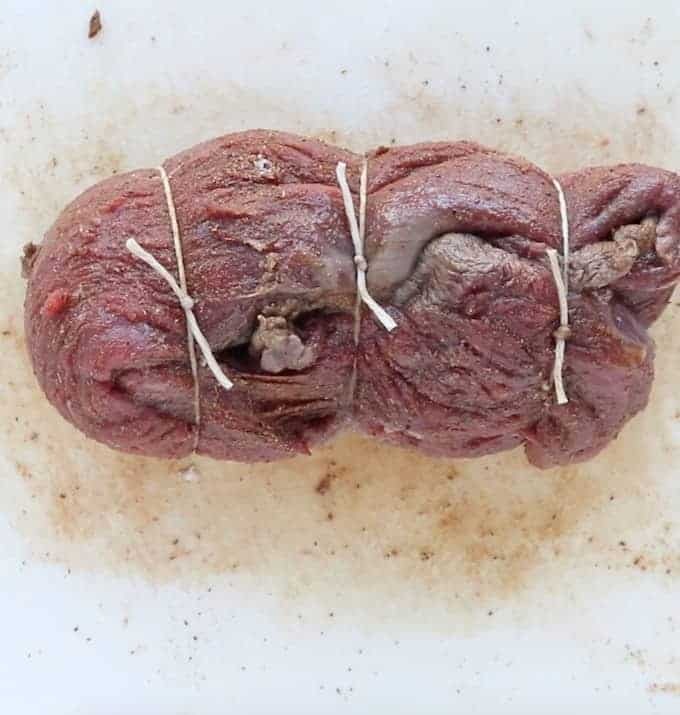 Cut 3 to 4 pieces of kitchen twine and slide it under the steak, then tie. Trim off the extra. The beef tenderloin steak is now ready to cook. To your hot skillet, add olive oil and butter. Using tongs, place the beef tenderloin steak into the pan to sear. Sear each side about 3 minutes, turning to sear all 4 sides. Pro Tip: Searing provides a nice crust on the outside of the steak and adds an amazing flavor that roasting alone cannot provide. Once you have all sides of the steak seared, place it onto your oven roasting pan…you know that pan that came with the oven that you never use?! 🙂 It works great for steak in the oven! 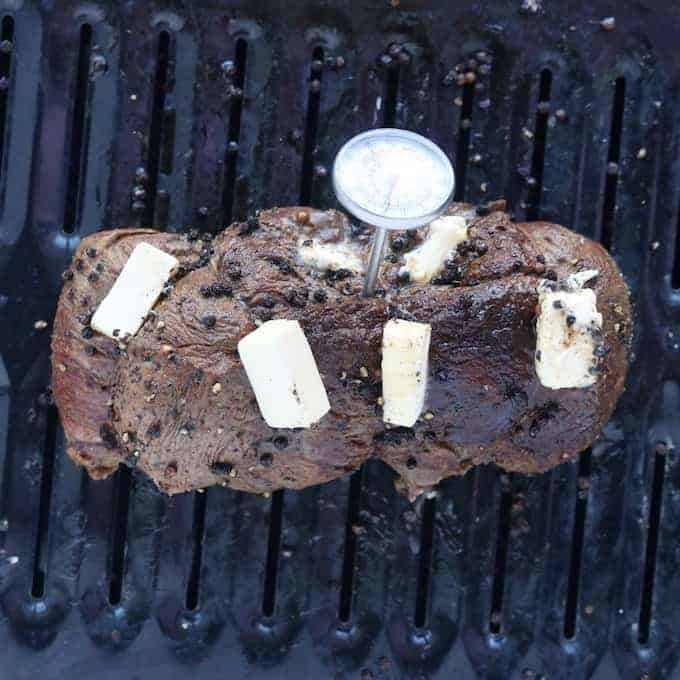 Next, spread the crushed peppercorns over the whole beef tenderloin steak, then place chunks of butter on the steak, and place an oven-safe thermometer into the steak. Pro Tip: Make sure that the thermometer does not touch the rack above in the oven. It will melt the thermometer (I speak from experience!). Roast whole beef tenderloin in the oven until the internal temperature reaches 140 degrees. This takes about 15 minutes. Make sure not to overcook the beef tenderloin steak. Tenderloin is lean and one of the most tender cuts around, but the lack of fat means that overcooking it will result in dry, tough meat. Pro tip: Tenderloin is best served rare or medium-rare, so use a thermometer to make sure it doesn’t get cooked past 140°F in the center. 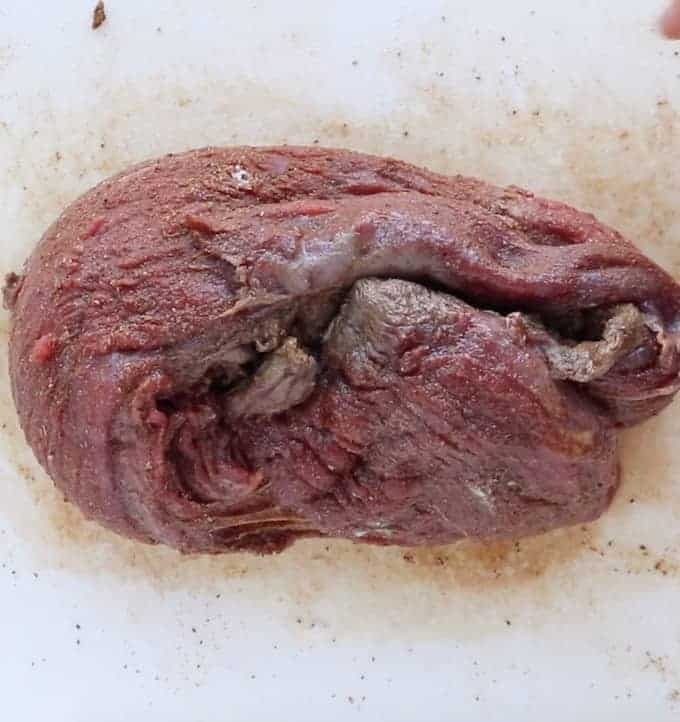 For guests who like their meat well-done, consider cutting a whole tenderloin into 2 pieces before tying and cooking them to different temperatures to please everybody. One of the biggest mistakes you can make, besides overcooking, is slicing the steak too soon. 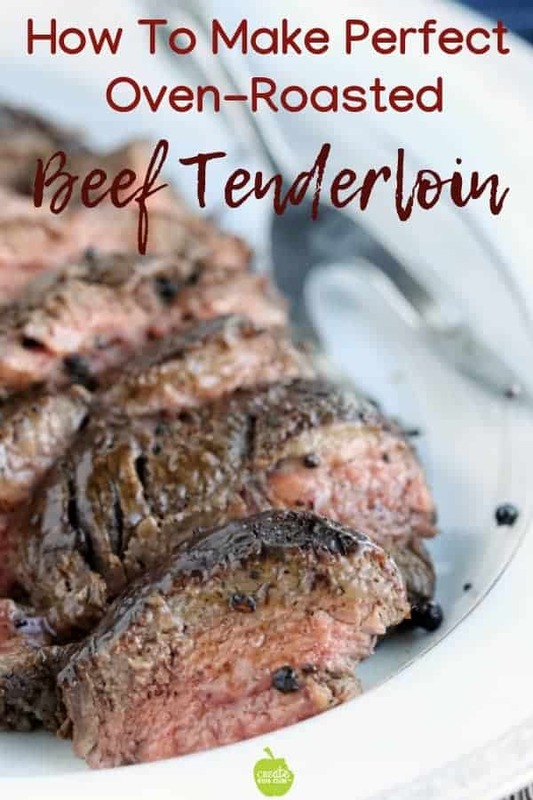 If you cut into tenderloin right after it’s been cooked, all the delicious juices will leak out onto your cutting surface rather than staying in the meat. The result is dry meat with less flavor. Pro tip: When your roasted beef tenderloin is done cooking, set it aside to rest for 10 to 15 minutes. This lets the meat relax and gives it a chance to redistribute and reabsorb all the juices. Slice the beef tenderloin across the grain. Slicing a steak incorrectly results in chewy, hard to eat steak. Check out the photo above and pay attention to the arrows showing the grain and then where to cut across this grain. If you’d like more info on why it’s important to cut against the grain check out this video that explains why it’s important to cut against the grain. Now the only question left is what to serve with your beef tenderloin steak! My favorites include Cheesy Potatoes, Brussels Sprout Salad, Mexican Corn Salad, or Caramelized Butternut Squash. The Best Whole Beef Tenderloin Steak recipe made in the oven. Tender beef tenderloin is seared then roasted to perfection for this special holiday meal idea. I love the step by step instructions. I feel like I can make this now! Thank you! !